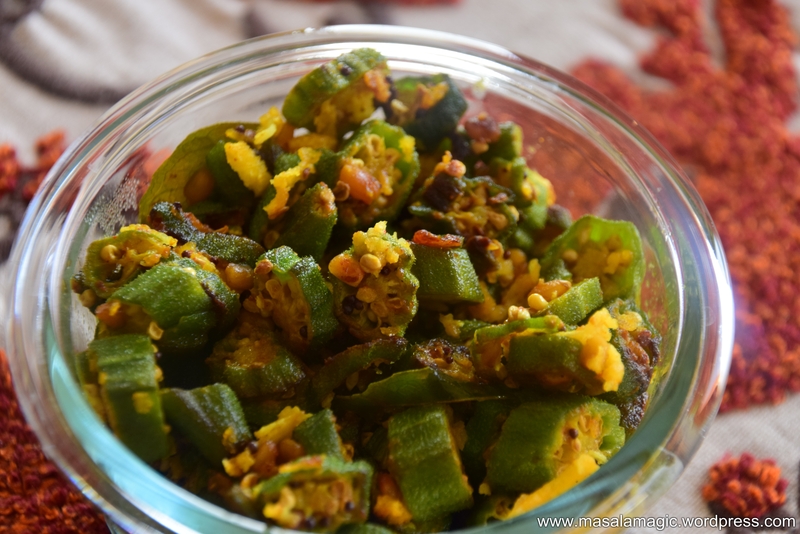 Okra or Ladies Finger is a favorite in my home. Any which way you make it, this vegetable tastes great with rice, roti or even eaten plain. Today’s simple recipe is a South Indian Dry curry laced with a hint of grated coconut. Tastes great as a side to rice and dal or rice and sambar. We even love it mixed with plain hot rice and a dash of ghee. Okra/Ladies Finger – Wash, snip of the head and tail and chop into small slices. Okra is a sticky vegetable, so care should be taken to make this dish patiently and in smaller quantities. I used about 3 cups of chopped Okra. In a pan, heat the oil. Add the mustard seeds, allow to splutter and then add the urad dal. Allow to turn golden brown. Add the hing and curry leaves. Then add the chopped okra. Add turmeric powder and mix well. Saute on low to medium heat. Add the sambar powder and salt. Mix well but gently. Sprinkle a little water and cover with a lid. Cook for 4 minutes or so. Open the lid and saute until evenly roasted. If required drizzle a little oil into the okra. Gently stir in between. 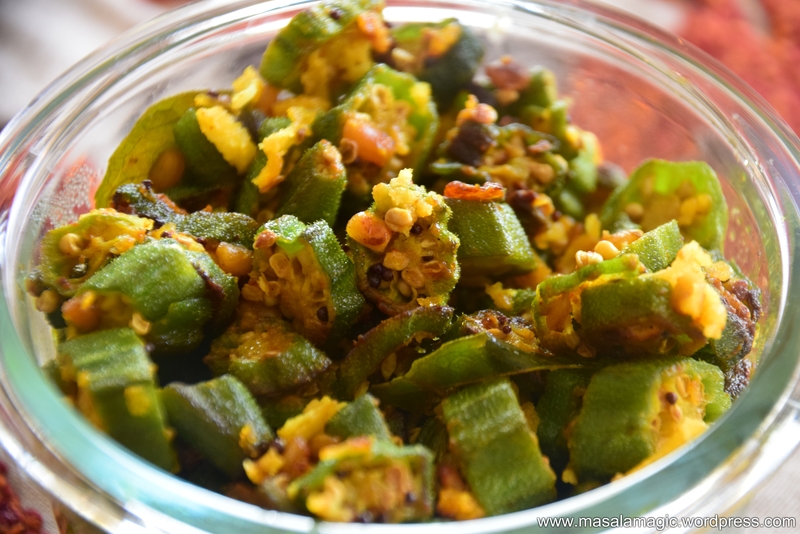 When the okra is evenly roasted, garnish with grated fresh coconut and serve hot as a side to rice. Bendakaya Koora with Perugu Anna (Curd Rice) is my idea of heaven!